Who’s ready for summer desserts? 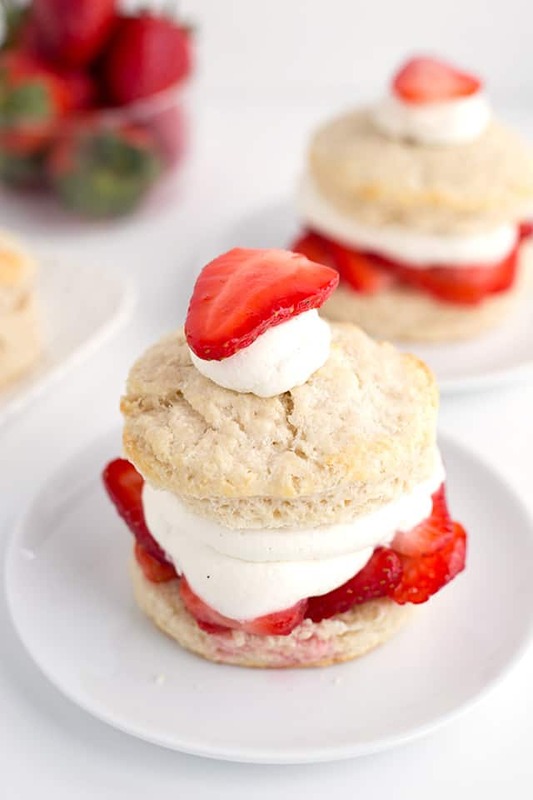 This homemade strawberry shortcake recipe will surely do the trick! 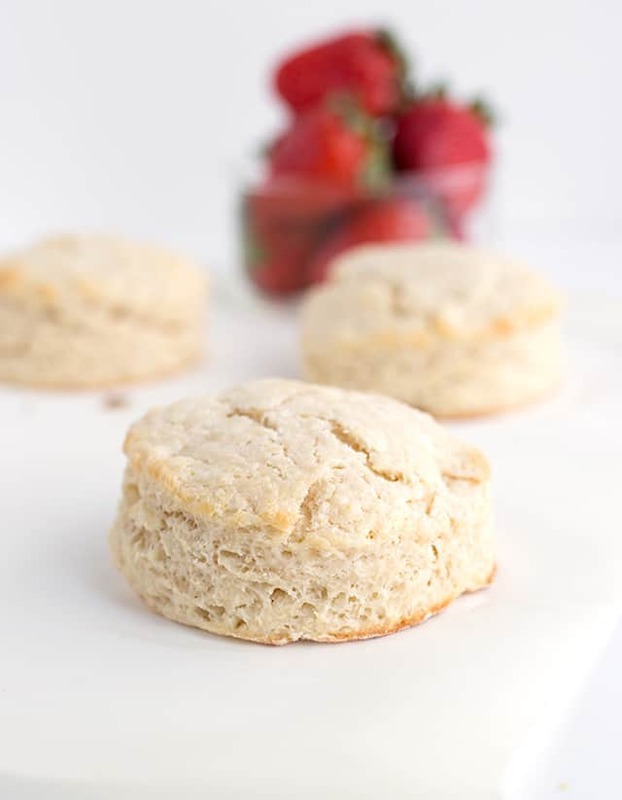 The sweetened buttermilk biscuits are so soft, slightly dense, and the perfect base to soak up the strawberry syrup! 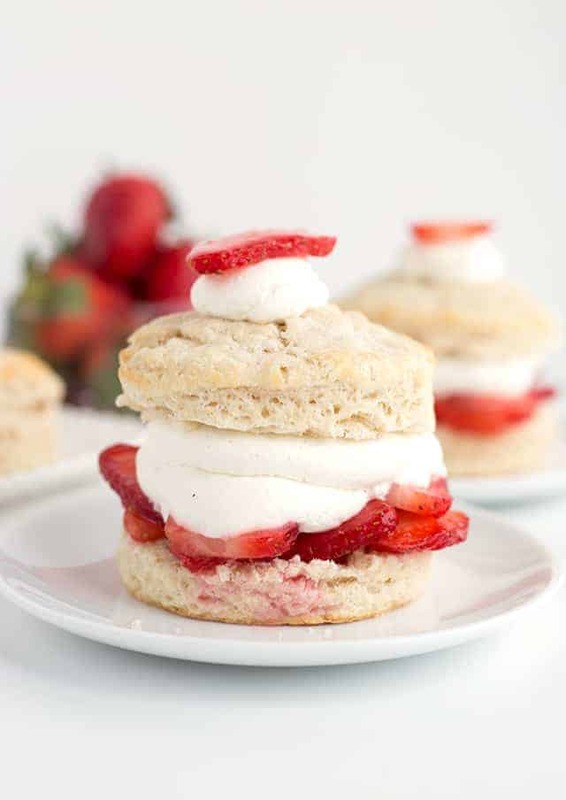 Add some macerated strawberries and freshly made whipped cream into the mix to finish off this shortcake recipe. I know I can’t wait to get some freshly picked strawberries for this recipe! Fresh strawberries are so sweet and fragrant. I love standing in the fields with the smell of strawberries wafting in the air. The bending over to pick said strawberries is a whole different story. I usually walk back to the care looking pretty crippled from the backaches I get from being bent over for a long time. Please tell me you can relate! I really don’t think I have to worry for awhile. Here in New York it’s still snowing, but I’m hoping it will eventually warm up. We didn’t make it to the u-pick farm last year because I was in the middle of baking up batch after batch of cookies for my cookie cookbook. It seriously felt like those days would never end. I love a sweet biscuit to pile fresh berries on. 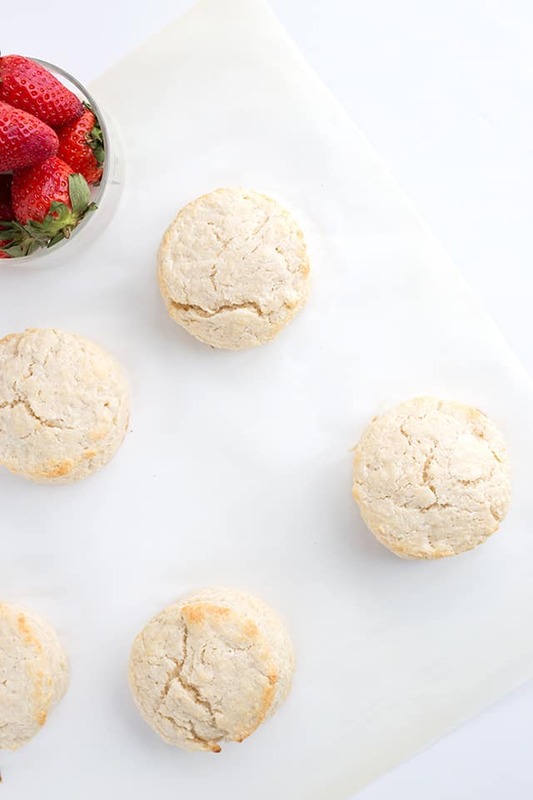 I spent a couple of days working on what I would call the perfect buttermilk biscuit for shortcake. I learned a few things along the way as usual. Don’t worry, I’ll share my tips and tricks with you! Too much butter or shortening will cause cracks in the tops of the biscuits. Brushing heavy cream on the tops of the biscuits make them shiny and helps brown the tops of biscuits up. 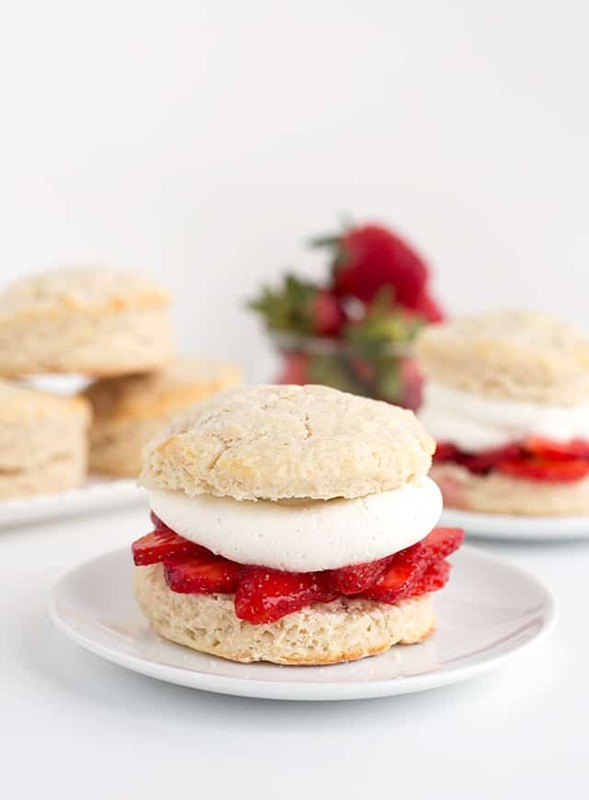 Another game changer for this homemade strawberry shortcake is a vanilla whipped cream. A plain whipped cream is great. I had it every time I had strawberry shortcake growing up, but the vanilla just adds another layer of flavor to a pretty simple dessert. Plus it only takes a 1/2 of a teaspoon of vanilla extract or vanilla bean paste added in with the heavy cream and powdered sugar. You have to try it! 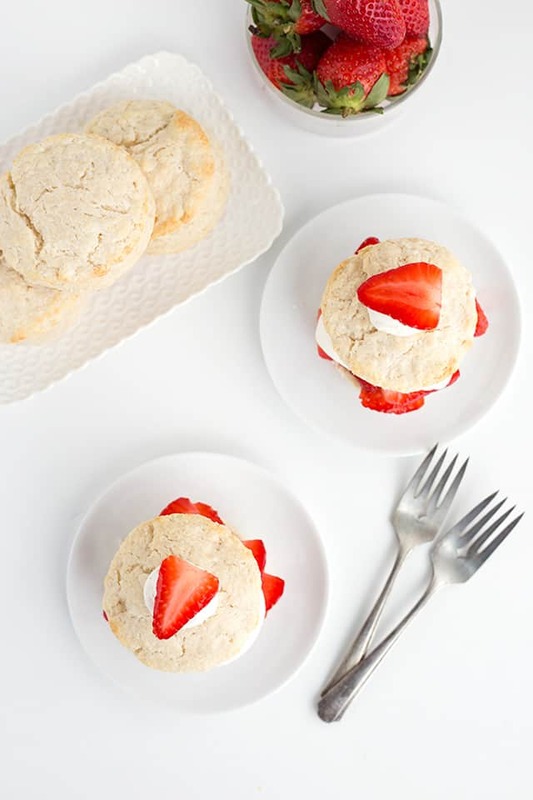 I did a ton of recipe testing for these strawberry shortcake biscuits. I’m far from an expert so I was going for practice makes perfect. I had SO many biscuits hanging out that weren’t quite up to par, that I took down a bag of them to my mom and still had SO many. I did what anyone with too many biscuits to eat should do, I froze them! Can you freeze biscuits that are already baked? YES! Wrap the completely cooled biscuits in tin foil or plastic wrap, pop them in a freezer bag, and freeze them. They should last 2 – 3 months. Can you freeze the biscuit dough? YES! Cut the biscuits out, place them on a baking pan and cover with plastic wrap. Place in the freezer until they’re frozen and then pop them into a freezer bag until you’re ready to bake them. They may take a few minutes longer baking in the oven if they’re frozen. 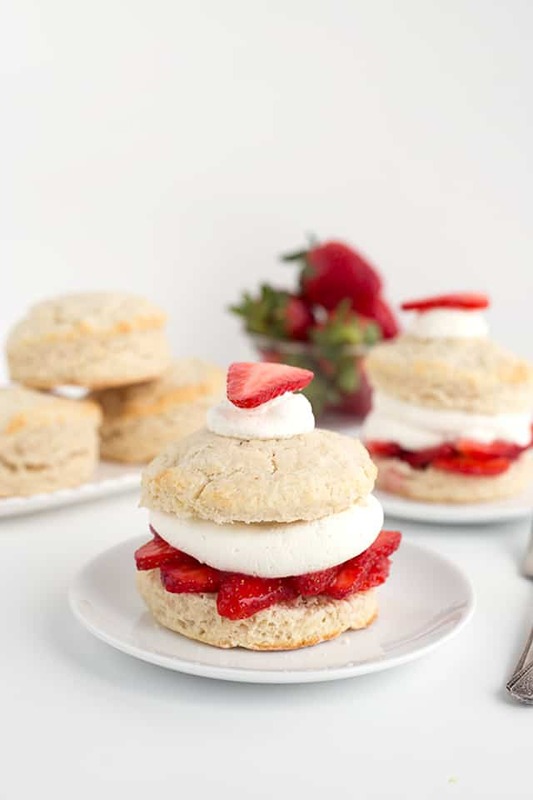 Want to try a boozy shortcake? This Redd’s apple fruit shortcake is amazing! Love strawberries? These recipes are my favorite! 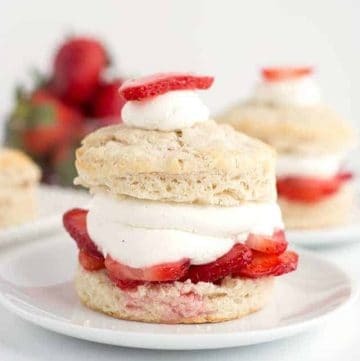 This homemade strawberry shortcake recipe has a sweet buttermilk biscuit topped with plenty of strawberries, syrup, and vanilla whipped cream! They make the perfect spring and summer dessert! Add sliced strawberries and the 2 to 3 tablespoons of sugar in a small bowl. Stir to cover the strawberries with the sugar. Cover with plastic wrap and let it sit in the fridge for about an hour until the juices are released. In a large mixing bowl, add the flour, sugar, baking powder, and salt. Stir to combine. Using a box grater, grate the butter into the dry ingredients. You can also use a pastry cutter and cut the butter into the flour until the butter has been into pea size crumbles. Add the buttermilk and stir until the flour is just incorporated. Give it a knead a few times with your hands if it didn't come together fully by stirring it. Turn the dough out on a lightly floured surface. Press the dough out until it's about an inch thickness. I used my hands and pinched together any big cracks as I was pressing it out. You can also lightly flour the top of the dough and roll it out. Using a biscuit cutter (mine was 3 1/2 inches), cut out 6 biscuits with it. Place onto the prepared baking sheet. Brush the heavy cream on top of the biscuits. Place into the oven and bake for 15 minutes. The edges should be golden brown. In a large mixing bowl, add in the heavy cream. Beat with a hand mixer on medium until it thickens to a soft peak. Add the vanilla extract and powdered sugar and continue to beat until stiff peaks form. Add the whipped cream in a piping bag with a large straight tip. Cut the cooled biscuits in half. Add strawberries and juice. Pipe a layer of whipped cream. Add the top biscuit. Add a small dollop of whipped cream on top and a strawberry. I posted this recipe for Strawberry Shortcake first on Yellow Bliss Road as a contributor.